Have you ever misplaced something? Of course you have. Have you misplaced a quilt? Probably not. I made this granny square quilt a couple of years ago. Dragged it to quilt market to submit it to a magazine and never did. We have hauled 100’s of quilts back and forth from show to show and have never lost one so I knew this quilt had to be somewhere. It could have been nicely packed with the show stuff, it could have been in the stack of quilts for trunk shows, it could have been on display somewhere throughout the buildings. No need to panic. It would show up eventually. Well surprise, surprise it finally showed up. I had packed it away in a very safe place and completely had forgotten about it. The mind is a terrible thing to loose, right? I was so excited. It was like running into a long lost friend. 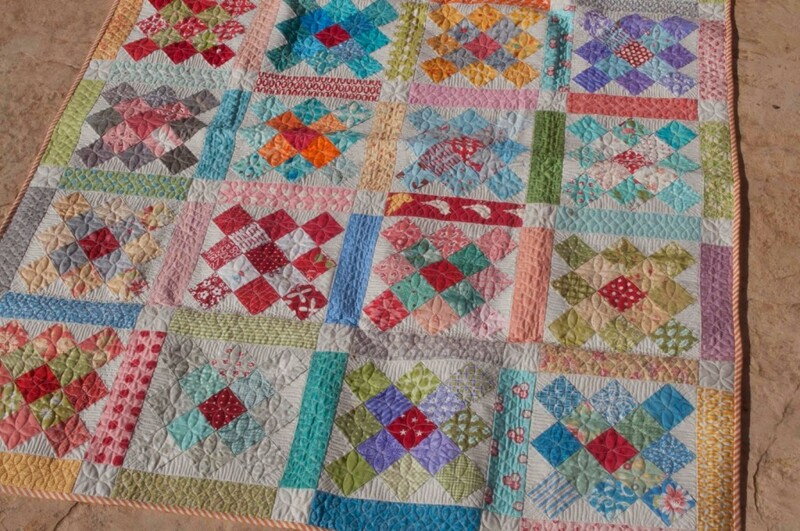 I love anything granny square and now that Lori Holt’s new book, Great Granny Squared is out I think I want to start another quilt. My favorite block used to be nine patches or log cabins but the granny square is quickly taking over the number 1 spot. This quilt is made from all kinds of moda candy 2 1/2″ squares. 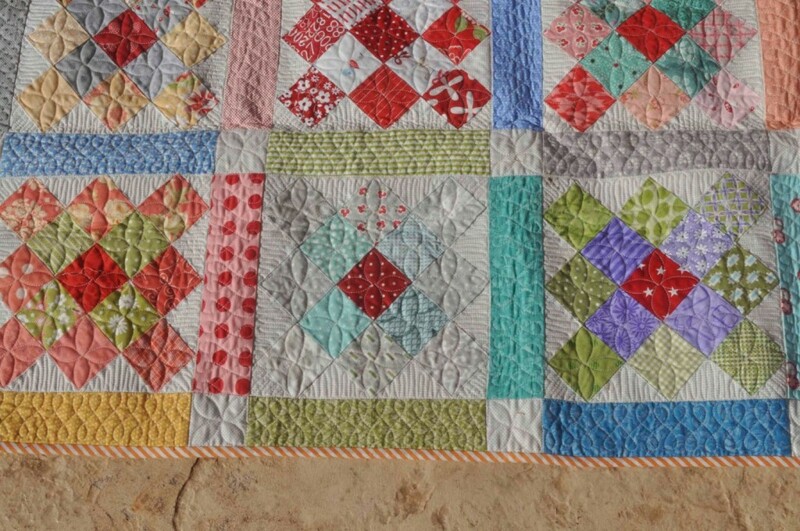 I love how each block looks different depending on the color and fabric placement. 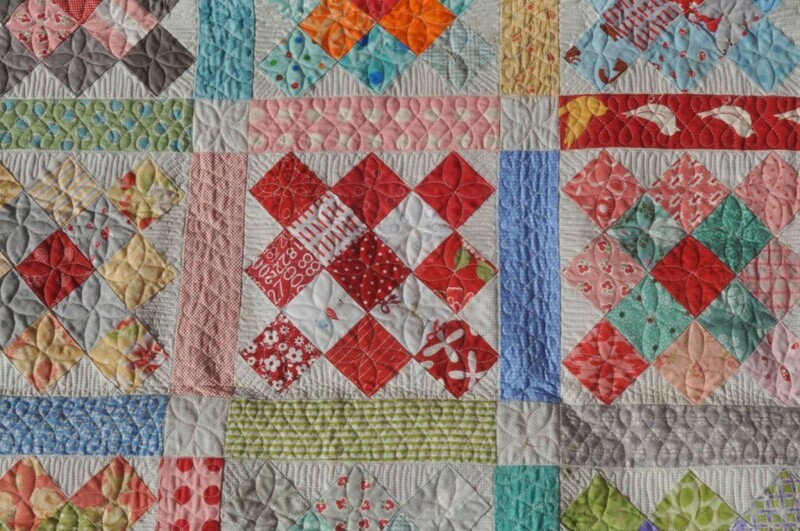 The red and white block shown above is one of my favs in this quilt. 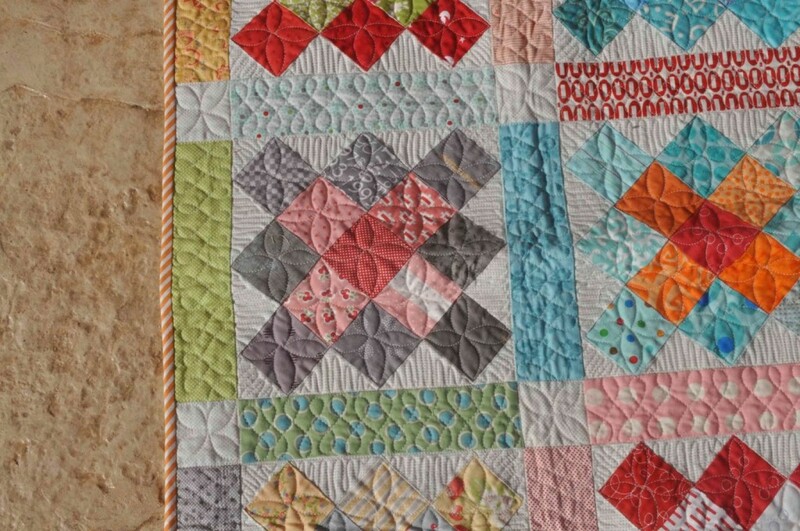 Striped binding cut on the bias…. I am obsessed about stripes and the color orange still so it is funny to see that I used this fabric as the binding over 2 years ago. 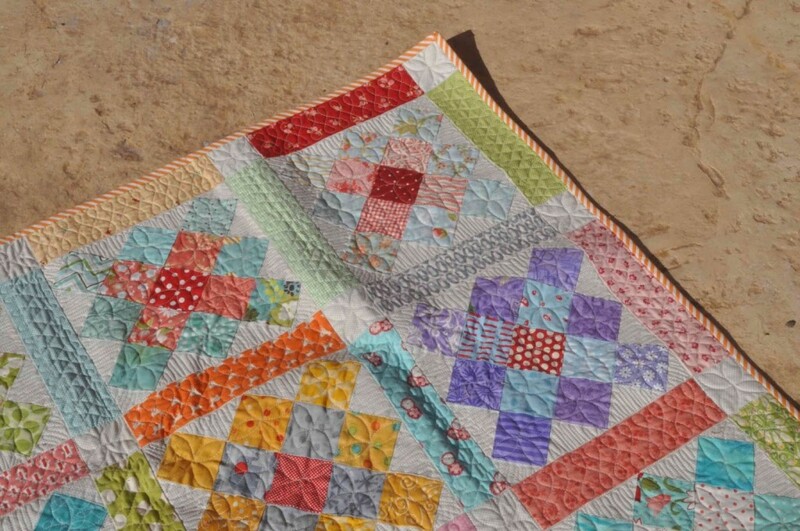 Do you have a favorite quilt block that you can just make over and over? 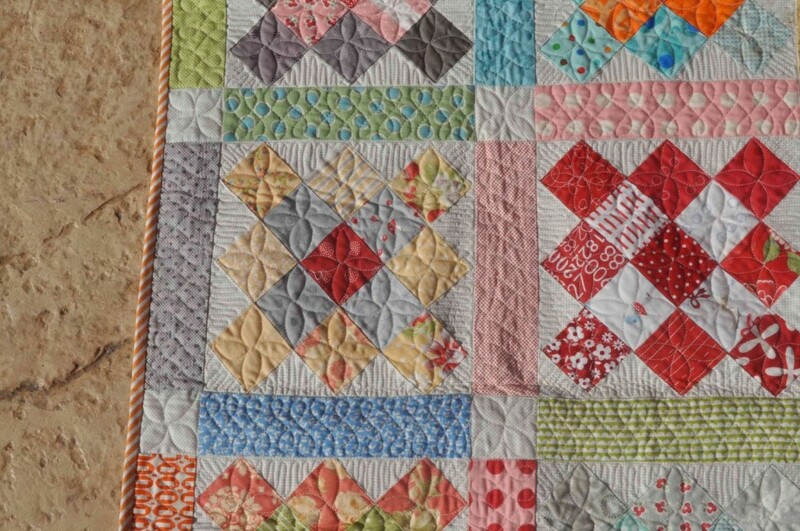 Glad you found it , it is a lovely, cheerful quilt, great for springtime! 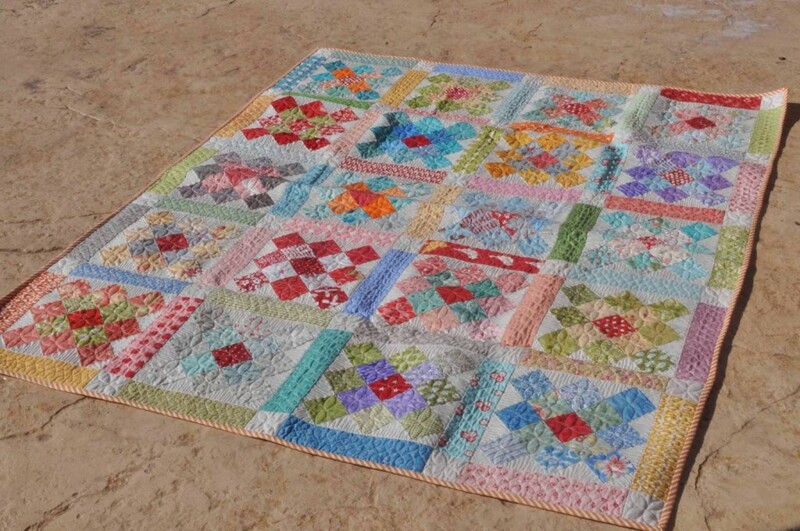 I really like 9-patch blocks and Ohio star ones too! I've made 2 granny square quilts. Love your's it's scrappy and coordinated at the same time. I think we are all victim to our "safe place" which ends up being more of a black hole from time to time 🙂 Glad you found it, the quilt is adorable! Glad you found it, its wonderful! My gramps passed last fall, before we started to clean up the house for the sale a meeting was called. The number one topic was Don't throw away anything with out looking through the pockets, pages, drawers. Gramps was notorious for hiding money. Even in jars in the yard. No map to tell us where they are buried! 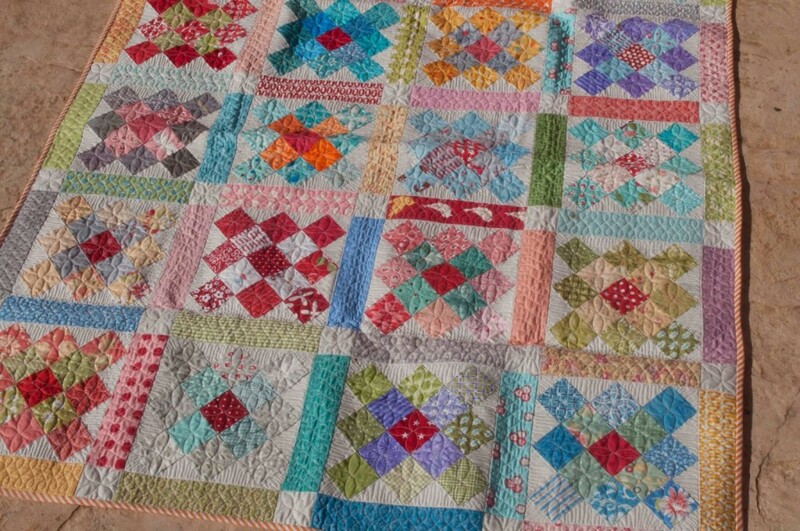 I love this one with the multi color sashing – how unique – I am finishing up one that I have made, two more borders to go and that top will be done! The last time you wrote a post about finding something that had been lost it occurred to me that I had no idea where to find the blocks I made in a beginning quilt class. I have since found them, but reading this makes me wonder what else I have misplaced. I can't remember, so maybe it is all good. My favorite block is the sawtooth star. I can't seem to get enough of it. But I really like your granny square quilt so maybe I'll try that in the near future. So glad you found your quilt! Geez I think I am heading in that direction because I am so organized that I forget where I put all my stuff amongst the organization. I say maybe we need notes and labels, lol. Note: there is money in … That would be great 🙂 So fun and I don't have a favorite currently but I do love a churn dash most recently, but I wouldn't call it my favorite. This is so cute Lissa!! What a fun way to use up Moda Candy!! And I am so glad you found it, that would be horrible if this beauty stayed lost forever. 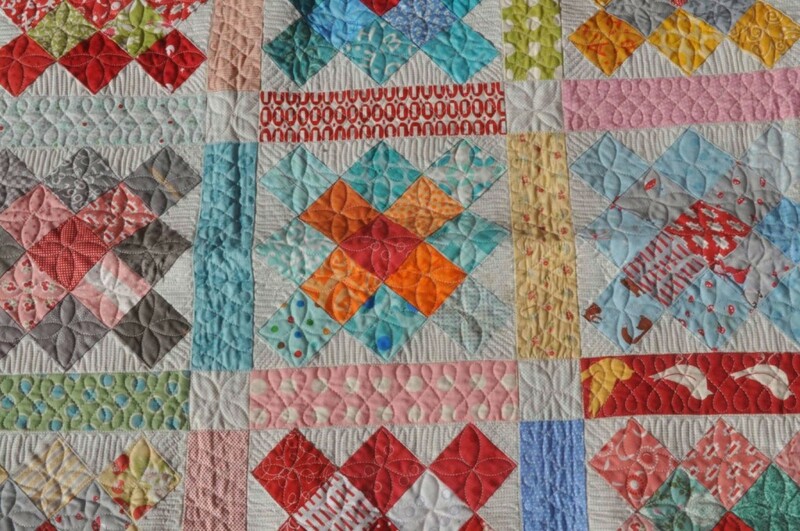 I am so happy you found that quilt…it is gorgeous! It for sure belongs on the cover of a magazine…and all that Moda Candy…I think I remember you blogging a while back that you were making a project with Moda Candy!